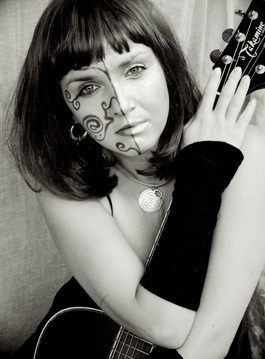 With her music Kijoka Junica follows the female American singer songwriter tradition. Stylistically the bottom line is acoustic folk but she playfully melts jazz, rock or classical elements into her songwriting, always returning to catchy hook lines that you find yourself humming on your way home. She performs solo and with different line ups. Since 1998 she has appeared on TV and radio and on numerous big and small stages and festivals in Germany, Czech Republic, Poland, Denmark, UK and the US. With the Kijoka Junica Band she released her Debut Album in 2016. Kijoka Junica has an ethereal quality which draws us into the inner world of beauty, magic and pain that is in everyone of us. It is a rare gift this exposure of dreams and visions, images and stories. Her haunting but powerful voice fuses beautifully with her intricate rhythmic guitar playing, which often takes unexpected turns opening up a completely new vista. At the same time this artist is not removed from us but is totally present in her live performances, real and tangible leaving no one unstirred. Although she is German she normally sings in Californian English which is an expression of her formative time spent there. This cultural melting pot had a strong impact on her artistic idendity which has now synthesized with her calm and thoughtful German persona.